This is part 2 of the Nederburg Auction talk I delivered on Saturday, September 29, 2012. Although we would like Brand South Africa to be defined by the great diversity of its wine, the fact is that the space currently available for South African wines on highly competitive U.S. retail shelves and restaurant lists is very limited. South Africa has two feet to tell its story, a national wine distributor executive told me. And the story that is often told is defined not so much by the wines as by their labels. If those two feet of shelf space include brands such as Sebeka, The Wolftrap, La Capra and Goats do Roam (all of which are or have been widely distributed in the U.S.), then the identity is clear. 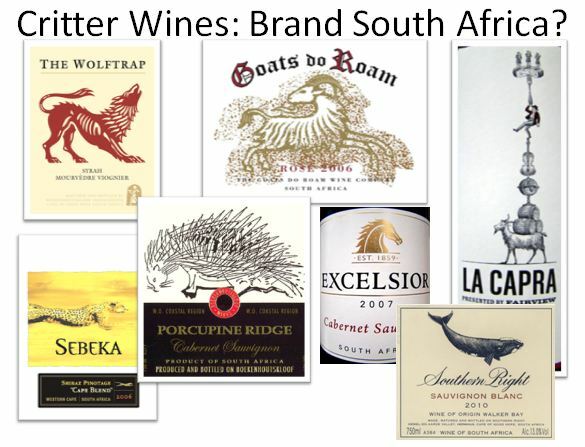 South Africa means “critter wines,” a class defined by Yellow Tail and Little Penguin. Critter wines are fun and often sell very well, but the image that they project is simplicity, not complexity, even when the wines themselves are not simple at all. The paradox of so-called critter wines is that while they can be hugely successful for the individual wineries that deploy them (think Yellow Tail in the U.S. market), they can potentially undermine a region’s reputation if they are so numerous and prominent that they become the de facto collective brand. So Brand South Africa could use an upgrade in the U.S. if you want to expand beyond the self-limiting critter category. But how? It is natural to look at the countries that have established new national brands in the U.S. market and to try to discover the secrets of their success. Australia then New Zealand and now Argentina are on the list of usual suspects. The one general factor that unites them is effective distribution. In the talk I also stressed another factor — the importance of international partnerships and strategic alliances — that I think runs through all these examples. Brand Australia was driven in part by Yellow Tail’s partnership with W.J. Deustch, the family distribution firm that previously carved out the U.S. market for Beaujolais. Brand Argentina owes much of its success to the Gallo company, which opened doors for Alamos, the best selling Argentinean wine in the U.S., and Don Miguel Gascón, the number three brand. And Brand New Zealand’s success was built in part on the high level of international investment in that country’s wine industry, which allowed brands like Cloudy Bay to take advantage of the sophisticated distribution channels that its owners – Möet Hennesy Louis Vuitton – had already constructed. Or Brancott Estate, which rides Pernod Ricard’s global wave. In property investment they say that the three most important things are location, location, location. In the structurally complex U.S. wine market, it is distribution, distribution, distribution. Effective distribution alone will not make a wine brand, but success is very difficult without it. Beyond this, however, Australia, New Zealand and Argentina are best seen are special cases that would be difficult (or perhaps even dangerous) to try to replicate. Brand Australia has suffered as the simple critter wine strategy has backfired. Argentina has been unable to extend the Mendoza Malbec wine brand to other varietals, although many still hope for a Torrontes surge. And New Zealand has also been frustrated in its attempt to expand the brand beyond Marlborough Sauvignon Blanc now that the Sideways boom in Pinot Noir sales has run its course. The Kiwis have had difficulty establishing other white varieties such as Riesling or Pinot Gris or the red wines of Hawke’s Bay in the U.S. market. Increasingly the “signature varietal” brand strategy is seen to be a one note samba rather than the first step towards broad market penetration. Although it is tempting to try to brand your excellent Pinotage or Chenin Blanc as South Africa’s version of a signature wine, this seems like a risky bet in terms of the U.S. export market. It is important to simplify wine a bit – which is what a signature varietal does — so that consumers, especially new ones, can understand it. But beware of Einstein’s Law. It is difficult to see how a single varietal could truly open the door to South Africa’s diverse wine portfolio. So how will South Africa win the Wine War for the U.S. market? Well, the good news, given what I have said, is that Brand South Africa is actually something of a clean slate for many U.S. wine consumers – especially the rising millennial generation who are open to new wines from new places and show no particular reverence for conventional wisdom. They are refreshingly original in their thinking, bold in their actions and willing to open their pocketbooks. These new wine drinkers and others like them around the world are high value targets. How should they be approached? Millennials are very independent. They are accustomed to writing their own narratives and they embrace products and experiences that integrate into a lifestyle experience. They aren’t just buying wine, they are building an identity. Millennials are not fundamentally different from earlier generations in this regard, simply more skilled, self-empowered and more interconnected. Reaching them, which requires more emphasis on story-telling, social media and first person wine experiences, is ultimately the task of South African wineries and their U.S. distributor partners; there is also a role for Wines of South Africa in shaping perceptions. Millennials and other “clean slate” consumers are predisposed to respond to the Terroirists’ Revenge message. They are seeking wine and a story about wine that connects them to the wine, to an engaging culture, to a rich and exciting lifestyle and ultimately to each other. It’s about the wine, but it’s not just about the wine. South Africa’s terroirists have a secret weapon in their beautiful land and inviting culture than gives them a critical Wine War story-telling advantage. How can South Africa connect with the Millennials, I asked the audience? Well, don’t look to me for answers, I said. I’ve only been in South Africa for a week. You will have come up with the answers. Only you will know what there is in South African culture and society that will make the connection. I think this statement came as a surprise to the audience, who are probably used to outsiders telling them what to do. But I am sure I am right. I felt I had to make a contribution, so I took a chance. My first full day on South African soil was Monday September 24 — National Heritage Day, which is also National Braai Day. Water keeps people apart, I told the audience, but wine brings us together. And the braai seems to bring South Africans together, too. And so I proposed braai as South Africa’s secret weapon. One possible key to this terroirist strategy – and this is my own crazy idea — is the braai. Almost no one in the U.S. knows what a braai is, but we all love the barbeque experience and this is a good starting point. Any country that makes the braai its national food culture speaks to us in a language we can understand. But the braai, I have learned, is not merely a food culture — and this is its magic. It is an expression of generosity and hospitality. If you ask someone to share your braai, you are opening your heart and your hearth to them, whether you are preparing a gourmet meal or more humble fare. If South African wines are seen as an extension of that warmth and engagement, they might well strike a sympathetic chord among American wine enthusiasts. And happily there are many different cultures of the braai in South Africa – there are diverse braai terroirs if you know what I mean – and each has its own story and each lends itself to a different kind and style of South African wine. Americans will love the unique experience of an Afrocentric winelands braai once they get to know it and this can be the gateway to a fuller appreciation of South African culture and lifestyle and to the diverse wines that have evolved along with them. 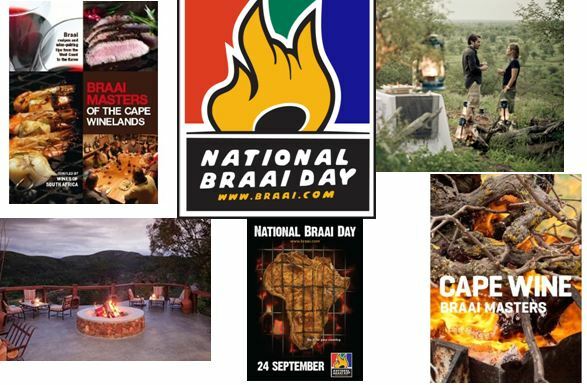 If you invite Americans to join with you and to celebrate your people, land and culture – to make every day National Braai Day — they will toast your success with your own wonderful wine. And that’s how South Africa can win the Wine Wars. Thank you. The photo above shows me with Jan Scannell, managing director of Distell Group, Ltd, South Africa’s largest wine and spirits producer and sponsor of the auction. Jan is holding the copy of Wine Wars I gave him. I’m holding a bottle of 1977 Nederburg Edelkeur Noble Late Harvest wine. I clearly got the better of the deal! By complete coincidence, Jan’s son (also named Jan but operating under the name Jan Braai) is the leader of the National Braai Day unity movement. 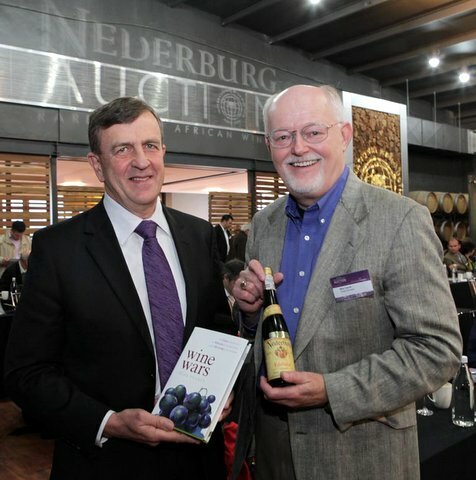 Thanks to everyone at the Nederburg Auction for inviting me to speak. Special thanks to Dalene Steyn and Lesley Gikas. Update 10/4/2012 The response to my talk has been pretty positive. Click here to read my favorite (because it is so unexpected) review. « Can South Africa Win the [U.S.] Wine Wars? Yes interesting topic of targeting the Millenial generation. I just read something else today that said that 65% of them are drinking wine on a regular basis and as you pointed out, are looking for new experiences that foster a connection. I think this generation will be more sophisticated and the Critter marketing will not work for this generation who want quality but at a fair price.